Great sounding travel guitar featuring a full-size neck with a solid spruce top for brilliant tone and projection. Includes case and strap. ..
Great sounding travel guitar featuring a full-size neck with a solid spruce top for brilliant tone and projection. Includes case and strap. Washburn set out to make an affordable, highly portable travel guitar but did not want to compromise on sound. 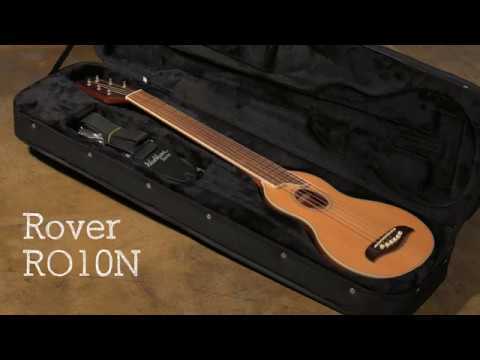 The result of their hard work was the RO10 Rover travel guitar. Featuring mahogany back and sides and a solid spruce top, the RO10 Rover has beautiful tone and surprisingly powerful projection for such a small instrument. The Washburn Rover also comes with a full length, 23.75” scale neck so it feels natural to play. You can play the RO-10 acoustic travel guitar exactly how you’d play your standard acoustic guitar. To make the Washburn Rover RO10 even better – it comes with everything you’re going to need to get playing and take it on the road! A premium case, guitar strap and three picks are included and the guitar is fitted with D’addario EXP-15 extra light phosphor bronze acoustic guitar strings, so straight out of the box your RO10 Rover travel guitar is ready to join you on any journey. Perfect for camping trips, parties or just relaxing in the garden, sized perfectly for fitting in airline overhead storage - the Washburn RO10 Rover is a great sounding travel guitar that is a lot of fun to play.